Hardy left the cab. He was visiting an ill Ramanujan at Putney. Ramanujan asked about his trip. Hardy remarked the ride was dull; even the taxi number, 1729, was dull to the number theorist. He hoped the number’s dullness wasn’t an omen predicting Ramanujan’s declining health. “No Hardy,” Ramanujan replied, “it is a very interesting number.” The integer 1729 is actually the smallest number expressible as the sum of two positive cubes in two different ways. Indeed 1729 = 13 + 123 = 93 + 103. The mathematicians Srinivasa Iyengar Ramanujan and G.H. Hardy comprise the characters of this story. Ramanujan’s casual discovery of the smallest so-called taxicab number was no fluke. Ramanujan and Hardy’s most famous result was an asymptotic formula for the number of partitions of a positive integer. A partition of a number n is a way of writing n as the sum of positive integers. Reordering terms doesn’t change a partition. Thus the partitions of 5 are 5, 4 + 1, 3 + 2, 3 + 1 + 1, 2 + 1 + 1 + 1, and 1 + 1 + 1 + 1 + 1; hence 5 has 7 seven partitions. Counting the partitions becomes difficult as n grows. 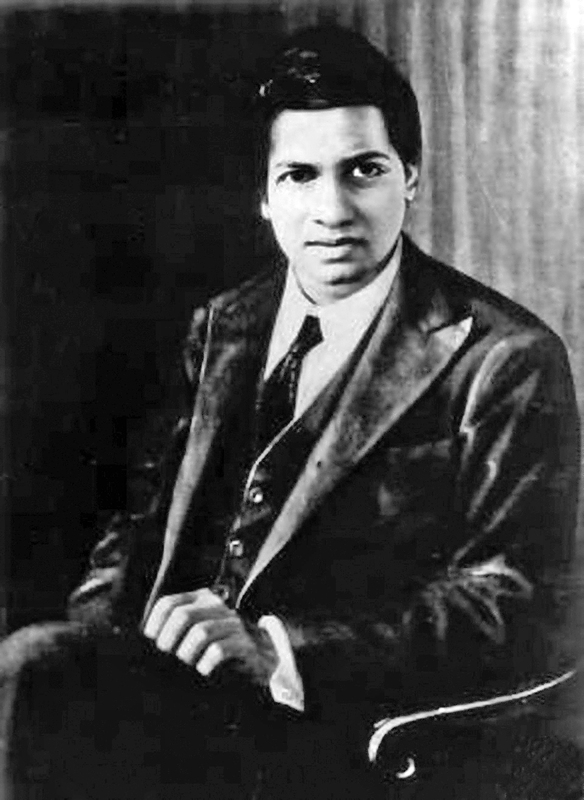 Ramanujan had made several conjectures based on numerical evidence, and Hardy credits many of the needed insights to Ramanujan. The formula is complicated and counter-intuitive. It involves values of √3, π, and e, all very strange numbers for a counting formula. Near his death, Ramanujan discovered mock theta functions, which mathematicians are still “rediscovering” today. These are only the achievements of later Ramanujan. The early life of Ramanujan is even more surprising. He spent his childhood in the poor south Indian town, Kumbakonam. In school, he scored top marks. He probed college students for mathematical knowledge by age 11. When he was 13, he comprehended S.L. Loney’s advanced trigonometry book. He could solve cubic and quartic equations—the latter method he found himself—and finished math tests in half the allotted time. If asked, he could recite the digits of π and e to any number of digits. He borrowed G.S. Carr’s A Synopsis of Elementary Results in Pure and Applied Mathematics by age 16 and worked through its many theorems. By 17, he independently investigated the Bernoulli numbers, a set of numbers intimately connected to number theory. So How did Ramanujan do it? No brilliant teacher—excluding Hardy and J.E. Littlewood when Ramanujan was already an adult—taught Ramanujan. The odds were against Ramanujan from the start. Ramanujan often used slate instead of paper because paper was expensive; he even erased slate with his elbows, since finding a rag would take too long. He lost his first college scholarship by neglecting his every subject that wasn’t math. The first two English mathematicians he sent letters to request publication did not respond; was it luck that Hardy did? Ramanujan credits Namagiri, a family deity, for his mathematics. He claimed the goddess would write mathematics on his tongue, that dreams and visions would reveal the secrets of math to him. Ramanujan was undoubtedly religious. Before leaving India, he respected all the holy customs of his caste: he shaved his forehead, tied his hair into a knot, wore a red U with a white slash on his forehead, and refused to eat any meat. In the Sarangapani temple, Ramanujan would work on his math in his tattered notebook. Hardy, the ardent atheist, didn’t believe that gods communicated with Ramanujan. He thought flashes of insight were just more common in Ramanujan than in most other mathematicians. Sure, Ramanujan had his religious quirks, but they were just quirks. Looking at Ramanujan’s work, I find it hard to deny that some god aided the man. I cannot even imagine Ramanujan’s impact had he lived longer or had better teachers. This entry was posted in European mathematics, Indian mathematics and tagged Bernoulli numbers, Brahmin, G.S. Carr, genius, Hardy, Hindu, Indian, Littlewood, math, math greats, mock theta functions, Namagiri, Number Theory, partition, poor, poverty, prodigy, Ramanujan, religion, religion and mathematics, S.L. Loney, taxicab, taxicab number on September 28, 2014 by abstractreasoning. are what historians believe to be the first known recorded zeros. Image: Tom Maloney, via Flickr. One of our recent homework assignments that I found interesting was the BBC radio excerpt called Nirvana by Numbers. This was fascinating for a few reasons. First of all, I was astounded to learn that India had contributed so much to mathematics and I had not heard about it until now. That was mind blowing. What is happening in the education world, that so few people know about their remarkable achievements? Secondly, I could really appreciate the idea of math being something spiritual. The view of math as something fluid and moving, rather than something stagnant appeals to me. People tend to have negative opinions about mathematics and it can be hard relating math to other mediums, like art, music, or religion. When in reality, math adds value to these things, and they all have mathematical elements. If we consider India around the time of 800 CE, we begin to understand what this middle ground of math and religion really is. We also come to learn about all of the phenomenal discoveries they have made. This component of mathematics containing spirituality (and vice versa) inspired the idea of nothingness or what we would today call zero. And what the Ancient Indians would call “Sunya.” According to the BBC article, “sunya” means void. In the ancient Temple of Gwalior, historians and archeologists have found what could be the first recorded zeros. As they began to do more math, zero became an important concept at the time because it made the point that nothing actually is something, and in some cases nothing is everything. What I mean by this, is that in certain religious beliefs like Hinduism, their word for creator, “Brahma” is equivalent to zero. And as our narrator points out, this is very different from Western culture, because our creator would typically be equivalent to infinity. Another initiative they started that we continue today, is to denote zero as a circle. They did this because a circle is symbolic to the sky, a circle of the heavens. The circle is also empty in the middle which is figurative of a void. So in their eyes there was a lot of overlap in terms of their belief system and math. For instance, one goal in life was to reach nirvana. Nirvana is the highest state a person can achieve where there is no suffering and no desire They would even go as far to say that reaching a state of nirvana is equivalent to zero. This too could have helped establish the concept of zero. Because of nirvana, they had an idea of “no” suffering, which meant there had to be a way to describe “none.” And thus the tangible idea of zero had blossomed. One idea that I was interested in exploring more, was the idea of Vedic Mathematics. The Vedas are ancient Hindu texts, that contain spiritual works. They possess instructions on how to do the basic operations like addition, subtraction, multiplication, and division. But not only that, they had processes in which one could determine area of a geometric shapes. Historians have even found early forms of Pythagorean’s Theorem. According to the people interviewed, as well as an expert on Vedic Math Gaurav Tekriwal, who instructs a TED-Talk, Vedic Math can be very easy. For instance in the TED-talk the general idea for multiplying two two-digit numbers is with a vertical and crosswise pattern. First we take the numbers in the one’s place and multiply them together. Then we cross multiply the one’s and ten’s places and add those products together. Lastly we multiply the ten’s place. The example he gives is 31×12, but let’s try our own. Say we have 24×20. Step one is to multiply 0x4, which is 0. This will be the one’s place of our answer. Next we take (0x2)+(2×4), this equals 8. This is the ten’s place of our answer. Finally we multiply 2×2 to get our hundreds place. This yields 480 as our answer. There is a very special case for multiplying with the number 11. The basic idea for multiplying any number with 11 is such: we separate them, put their sum in the middle and that gives us the answer. Let me demonstrate with 26×11. We take 26 and separate it, so that there is a space between the two numbers. We then add 2 and 6 and put the answer to their sum (8) in the space we left when we separated them. This gives our answer to be 286. Multiplying by 11 is a special case, it is just an extension of the general idea for multiplication in the Vedic sense. It uses all of the same ideas we used in the first example. However because 11 is comprised of all one’s, we can skip the cross multiplication and go straight to the addition. So as we can see, multiplying with these rules is quite simple and fairly straightforward. In the BBC post, there are two men who have differing opinions about Vedic math. One thinks that it makes math more fun, whereas the other thinks that the ideas and concepts of math do not get taught, just the routine does. And based off the TED Talk I watched by Tekriwal, multiplication does seem much easier, but I can see how the notions could get lost on a student. I read another article that discusses Vedic Math in terms of the Jain religion. According to this article, the Jains had formulas for circles, like circumference and area, and in some cases could determine answers from quadratic formulas/equations. Another great contribution the Jains made was the concept of a positional number system. In other words, putting all the one’s digits in the same place, all the ten’s digits in the same place etc. They also loved large numbers and contrast to the establishment of zero, this was the start of infinity. One such large number was 10 to the 53rd power! Wow! That’s big! This article states that the Jains had five kinds of infinity. And those were: infinity in one direction, two directions, area, everywhere, and perpetually. The article also talks about how the early Jains were developing permutations, combinations, and had early stages of Pascal’s triangle in the works. It was called the Meru Prastara. This article unfortunately did not go into the religious aspects I was hoping it would. But nonetheless, from what I learned through the BBC clip, religion in ancient India played a key role in the root of their mathematics. From zero to infinity, math was being incorporated into their sacred texts and their lives. This is something we can all bring into our personal life, even if you are a nonreligious person like me. Knowing that math is beautiful, and sacred, and has an element of spirituality to it, makes me much more excited to do my math homework. It seems less dreary, less gloomy. I will start treating math more like a combination of art and science. I think this could not only benefit me, but how we teach kids math. If we start telling them it’s a creative process, maybe more students will be excited about doing tedious algebra problems. This entry was posted in Indian mathematics and tagged Mathematics, nirvana, religion and mathematics, zero on September 8, 2014 by marycneville.